HALLIE EPHRON: Meet Joseph Olshan, Vermont-based author whose mysteries are praised by reviewers as "literary," "evocative," and "bracing." 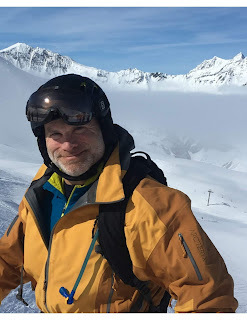 Read the opening of his new novel, Black Diamond Fall, and you'll experience vicariously a ski run so compelling that it leaves you breathless. Joe is here today to talk about the true crimes, personal experiences, and great writers that inspire the mystery. JOSEPH OLSHAN: On my way to do a book event yesterday, I was chatting with a friend of mine—perhaps the only person in the United States who teaches suspense and mystery writing in an MFA program. And she said something to me that resonated: that if one decides to write within a mystery and suspense framework, then one can write about anything and the reader will follow. That trope is a perfect description of what I’ve been trying to embrace in my last two novels: Cloudland; and the recently published Black Diamond Fall—both of which are deeply personal, autobiographical works. 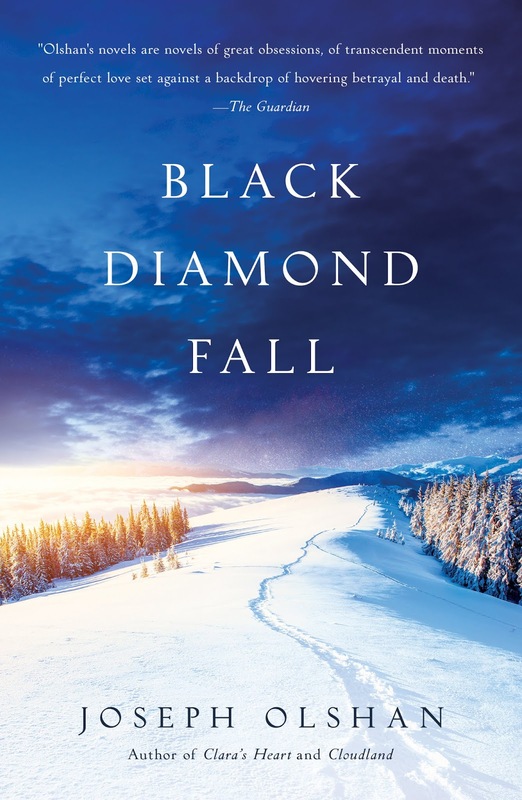 Black Diamond Fall was galvanized by two unrelated events that occurred within a short period of time of one another in Vermont: the disappearance of a Middlebury College student, and the vandalism of the Robert Frost Homestead in the nearby town or Ripton. Each of these occurrences became national news, and for a time before the student’s body was found, it was theorized that he might have been the victim of the Smiley Face murderers who’d been abducting and killing male college students nationwide; a smiley face was actually found painted on a warehouse in Middlebury near to where he disappeared. But this turned out to be a false lead. The young man, who was staying on the college campus during winter break, went for a walk after a particularly intense conversation with a friend. He may have had a drink or two, and it seems that he fell down close to the Otter Creek, lost consciousness, and succumbed to the extreme cold. There was a search organized but he was never found. Months later his body was discovered at the bottom of that river. It was never determined what might have set him off on that nightly stroll except that ultimately he was responsible for his own harm. It was real life now, maybe even real love, named hours before in a sort of fever, a shiny token tossed into a deep well that still glimmered from far below. But Luc was gone by 8 a.m., and listening to his car drive away with a crushing sound of gravel, Sam felt terribly alone. And so I created a man very similar to myself who gets involved in a secret relationship with a much younger man, and while the character based on me is out in Utah trying to prove himself on an extremely challenging off-piste ski run, the younger man is playing a game of pick-up pond hockey and after the game is over he suddenly disappears. The greatest challenge of writing the novel was perhaps finding a way to write about the vandalism of the Frost Homestead. I started the novel without knowing how I was going to link it to the disappearance. But then, as I went along an idea came to me: make the mother of the young man who vanishes a friend of the late poet, give her some connection to the Frost Farm. I did this and then with a bit of imagining was able to conjure up a jaunty pair of blond dreadlocked body-builder twins who have a personal vendetta against Robert Frost and, therefore, a motivation for breaking and entering the homestead museum dedicated to his Vermont life. They, among several other people, come under suspicion for having a hand in the college student’s disappearance. Lastly, I invented pair of detectives investigating both crimes, two seasoned professionals who, from the very beginning, suspect there is a link between them. But how to bring these characters to life, especially investigator Nick Jenkins in whose point of view the novel at times comes to rest. And then it came to me that my detective should be the same age as my middle-aged male protagonist in whom he recognizes his own struggles with getting older, and, in an interesting twist, as a straight man in a dying marriage who comes to envy the intense passion of a gay man suspected of murdering his younger lover. Nobody has pointed this out yet, but I named the detective in Black Diamond Fall after the protagonist in Anthony Powell’s series of sequential novels called Dance to the Music of Times published in the 1950’s. My Nick Jenkins is a kind of homage to Powell’s Nick Jenkins, although admittedly my Jenkins has little resemblance to his, except, perhaps for sharing a kind of unvarnished earnestness. Indeed, in all my suspense fiction I try and pay tribute to great writers. In my last novel, it was Wilkie Collins and a forgotten manuscript that my narrator comes to own. In Black Diamond Fall it’s Robert Frost’s life and his poetry that the mother of the missing college student turns to for solace. And then placing all of it under the umbrella of Anthony Powell whose novels are so beautifully orchestrated that I have to believe they will be read forever. HALLIE: Wilkie Collins, Robert Frost, Anthony Powell; poetry and winter sports; true crime and true love. Joe's sources for Black Diamond Fall reminded me of the quote, attributed to "Writing is easy. You just open a vein and bleed." Reds and readers, do you see echoes literary greats in the crime novels you love? Shakespeare? Steinbeck? Austen? Congratulations on your newest book, Joe . . . .
Wow, Hallie, that’s a tough question. Sometimes I read a book that evokes a feeling of another writer, such as a style or setting that brings that other writer to mind, but I don’t know if that connection was the specific intent of the author. Mostly I notice the more obvious ways Joe has mentioned, such as in a character name or with a specific reference, such as the Frost House . . . . I agree - though when I read reviews that praise a novel's Proustian imagery or Faulknerian prose or Shakespearean tragedy, I'm intrigued. It's a balancing act writing a mystery - you don't want the art to detract from the story. I know, that sounds weird. In Black Diamond Falls, they're complementary. Which is what you want. Hi Joan: I thought I would say that the way many writers have a series featuring a single character, I am trying to write books that acknowledge a writer. I started this in my last novel, Cloudland, with Wilkie Collins, I continued in Black Diamond Fall with Robert Frost. And the novel I am writing novel venerates the Italian writer, Primo Levi. I can't say that I do, but I haven't been looking for it, either. The book sounds great - congratulations! Wow, Joseph, this book sounds AMAZING. I am actually not sure how this didn't get on my radar, but with so many books being released, even my expert research skills in relation to my book review blog (BOLO BOOKS) sometimes let me down. And typically, the Jungle Reds will come by to save me! (Thanks Hallie). Having an English degree - with a concentration on minority literature - I probably see more allusions than the average reader. Sometimes they are meaningful, sometimes just nice touches of homage. I have been impressed with the last few Laura Lippman books (well, hell, I am impressed with everything Laura writes). But the last few have been crime novels that have their origin in classic literature. WILDE LAKE has definite connections to TO KILL A MOCKINGBIRD; SUNBURN is forever linked with the works of James M. Cain; and next year's book began with a close look at a relatively minor moment in MARJORIE MORNINGSTAR. Enough talking, I'm of to order Black Diamond Fall. I should also say, NIGHT SWIMMER, was an incredibly important book for me. And then the fabulous CLARA'S HEART. Thank you for your writing, Joseph. Hi, Kristopher! Those are great examples. A lot of modern authors channel classic movies, too. I tried to do it myself in the opening of NIGHT NIGHT, SLEEP TIGHT, riff on SUNSET BOULEVARD. Oh yes, Hallie. I remember both of those openings very well. Hi Kristopher, I am so glad that Jungle Red Writers has put my new book on your radar. And thanks for your gracious comments about my other books! Wow, Joe! I so look forward to this book. I will track it down ASAP. Hi Brenda. I'm glad my post inspired you to check out the book! Thanks again, Reds! Another intriguing author--another story too enticing to resist--says someone with several volumes of Robert Frost's poetry on her shelves. To answer your question, Hallie, I wouldn't say it's obvious to me that a certain writer might be writing in the style of 'X'. But I do notice the use of language--how some books are overflowing with lush descriptions, words piled upon words to build characters, settings, worlds--and then there are authors whose prose is so spare--like a poet, they've chosen each word so carefully that to change one would be to destroy the whole nuance of character, setting, or world they've created. Hi Flora: While I do extoll the virtues of some of these great writers in my work, I don't feel they influence me stylistically. Everybody here will probably agree that we all have to work out the voice of a book we're writing before we get very far. In my case, the voice came pretty quickly even before I figured out how Robert Frost was going to figure in the novel. I notice this a lot, and I'm drawn to writers who evoke those I've loved in the past. I also love finding an Easter egg: a character or circumstance or locale that is a hidden reference. Rhys is good at this by the way. I also like finding a writing style connection to one of the greats such as Dorothy Sayers, P.D. James, Agatha Christie, etc. Or even better, the retelling of an old story delights me. If you haven't read Jo Nesbo's MACBETH, you've missed a treat. Flora, I understand what you are saying about language. I just read a wonderful book that didn't have one spare word in it, TRANSCRIPTION, by Kate Atkinson. So admirable. Hi Ann: I love Kate Atkinson and she really has created a new approach to writing novels that transcends genre. Holy moly. You wrote Ckara’s Heart!!! Yes, I wrote Clara's Heart. And, picking up on what I wrote to Hallie below, that novel was really a struggle for me. I think it's because I began writing it when I was pretty young—23—and just didn't have the skills to complete a novel. I learned as I went along, and I took many, many wrong turns before I got the book right. And even now there are things in the novel that I would change if I got a chance. Well after the book was published, Grace Paley made a very wise comment about a certain scene that she thought was a bit too melodramatic and argued that the novel actually didn't need it. I now realize that she was right, although at the time I didn't agree with her at all. This sounds SO great. And lovely to read this. And little know fack (;-)) all of my TIME books reference Shakespeare's plays--specifically The Tempest, Romeo and Juliet, Comedy of Errors, and Winters Tale. And Joe, I do love how in a writer's mind, the puzzle pieces of lives come together to form a new story. Hi Hank Phillippi: I don't know about you but for me writing a novel is fitting the pieces together and this is why I never work from an outline. I think the pieces are part of some kind of divine intervention if that makes any sense. Congrats on your new book, btw. Joe, that is so much exactly how I think of it that it's actually strange to see you put it into words. I'm glad we think alike, Hank Phillippi. As you can attest, writing alone in a room can make you feel that nobody in the world thinks like you! And Deborah, congrats on your book as well! Hi Joseph, and congratulations on your book. I don't think I can resist a novel with a connection to Robert Frost! Hallie, I don't know that I notice parallels to literary greats when I'm reading, although I do notice similarities in style. You've given me something new to think about! Thanks Deborah: I agree with you, actually. I don't know if you've heard of Colm Toibin's novel The Master which is about Henry James and written in a style like Henry James. As much as I admire Toibin, I think The Master is one of his less involving novels. Welcome, Joseph and congratulations on the new book! Do you have ideas for future books lined up ready to go? Are you one of those writers who sees story ideas everywhere he looks? Hi Ingrid: I am writing a new novel. I am 100 pages in. It is based on an experience I had in high school. I had a college professor as a mentor and one day, without any warning, he committed suicide by hanging himself. He did not leave a note. I always wondered if he actually ended his own life or somebody forced him to do so. The novel is about this. But I don't see ideas everywhere I go. On the contrary, many ideas come to me and I realize that I won't be able to execute them. I am one of those writers who is painfully aware of what I cannot do or cannot pull off. I hope this makes sense. It makes complete sense, and I can relate to that feeling when a great idea turns out to be not so great! and my question is one I always hate to be asked... how long does it take for you to "finish" a novel (until it's ready to send to your editor)? I'm guessing you're not pumping bookS a year. Hi Hallie: Thanks for your question. You are right, I am not pumping them out every year and my hat is off to anybody who can do this. Writing a novel is always a struggle for me and, I must confess, has only gotten more difficult each time around. I'm not sure why. And yet my best novel took only 9 months to write. It's a book called Nightswimmer. But that was an anomaly. Then again, it appeared when I was 36. Three years is the average length of time I take to write a novel. Wow, Joseph! What an interesting description of how your characters and story evolved for Black Diamond Fall. Taking the two unrelated events and melding them into an intriguing story is a fascinating process to read about. Being a long-time fan of Robert Frost makes your book especially interesting to me. Thanks for letting us be privy to your process. 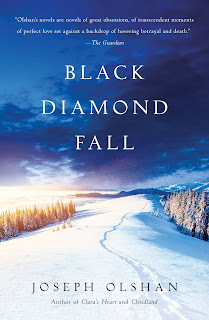 Black Diamond Fall is going on my TBR list. I admit that I'm a sucker for literary references in books. Majoring in English in college does that to a person. I just finished Elly Griffiths' first stand-alone, due out in the state next March and in the U.K. this month, and the main character is an English teacher, so there are allusions to love here for sure, most notably Wilkie Collins' The Woman in White. And, there's a made-up classic author, too, which is great fun in a gothic, spooky way. Hi Kathy: This sounds really interesting. I think I will check it out. Thanks for mentioning it.